There are many different types of body scrubs. Some are made with natural ingredients, but they can be pricy. Other products contain synthetic fragrance. The skin on the face is fragile, so a body scrub that contains caster sugar or fine sea salt will be fine. The normal sugar or salt granules may be too harsh. Christmas is an expensive time, and not everyone has a disposable income. 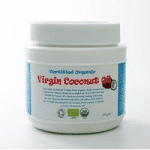 A coconut oil body scrub makes a perfect gift for your loved one this Christmas. Other luxury ingredients are added, which will moisturise the body during and after a bath or shower. Add the sugar or salt into a large bowl. Melt the coconut oil in the microwave, or on the stove. Add the shea and cocoa butter to the bowl. Pour on the coconut oil and mix until it forms a paste consistency. You may need to add more sugar/salt or oil during this process. Melt a spoon of coffee in a little water and add to the bowl. Mix well and transfer to the glass jar. Voila! A luxury Christmas gift that contains edible natural ingredients, is kind to the skin, smells delicious, and can save you money too!